Get the latest information on the LEAF. Media / Press Release information for immediate release. Contact us for high-resolution images. 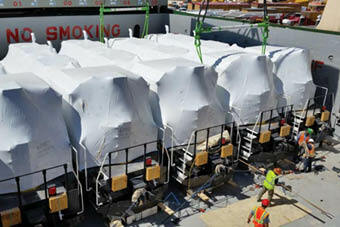 The first Railserve Tier 4 DUAL LEAF® Gen-Set Locomotive has been placed in service. The unit is performing well for a Railserve customer and generating more interest in the powerful switching locomotives that provide significant reductions in fuel use and emissions. A shipment of sustainable locomotives built in the United States by Railserve set sail last weekend on a 6,000-mile ocean voyage to Africa where they will soon be in operation as freight locomotives in Gabon. ATLANTA, GA—November 4, 2014—Brookhaven Rail Terminal (BRT) and Brookhaven Rail (BR) recently announced the arrival of their new genset locomotive. Fairmount Santrol announced today the company has deployed a Railserve LEAF® Gen-Set locomotive at its Roff, Oklahoma, resin-coating plants, as part of a continuous commitment to a minimal operational footprint. The locomotive uses 50% less diesel fuel in less time to move six times the number of railcars around the two Roff property plants. Railserve has rolled out a new remote monitoring system for its LEAF Gen-Set® Locomotives that provides real-time, mission-critical performance data to improve safety and operating efficiency. Railserve Dual LEAF Gen-Set Locomotive Debuts. Railserve, the leading North American provider of sustainable, economical switching locomotives, has completed production of its first three Railserve Dual LEAF Gen-Set Locomotives, each with two genset power modules for increased pulling power. Railserve, the leading North American provider of sustainable, economical switching locomotives, is making available a white paper titled "Utilizing Genset Technology in Locomotive Power at Intermodal Railyard Operations." The paper was recently delivered at the National Conference on Intermodal Transportation (NCIT). Railserve, the leading North American provider of sustainable, economical switching locomotives, has announced the delivery of a Railserve LEAF® GenSet Locomotive to Fairmount Minerals at its Wisconsin Industrial Sand Company (WISC) facility in Maiden Rock, Wis.
Railserve, the leading North American provider of in-plant rail switching and associated services, has announced the appointment of Timothy Morrow, plant manager, LEAF Production, Railserve Parts Division. Morrow was previously senior product development manager, Guardian Building Products. Railserve, the leading North American provider of in-plant rail switching and associated services, has appointed TJ Mahoney as program manager for Railserve LEAF® GenSet locomotives. Railserve, Inc., the leading North American provider of in-plant rail switching and associated services, announced the selection of James Street Associates as its marketing communications agency for the Railserve LEAF GenSet Locomotive. James Street will implement a strategy to expand awareness of the environmentally-friendly and efficient locomotive. 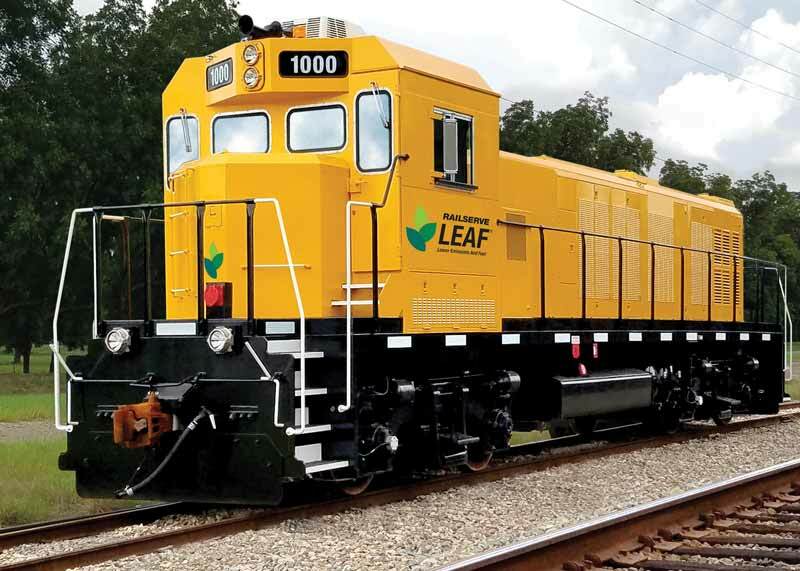 Railserve, Inc. is pleased to announce the sale of its first Multi-GenSet Lower Emissions And Fuel Locomotive (LEAF®) to Archer Daniels Midland (ADM) in Decatur, IL. Have questions about the Railserve LEAF? If you have questions or want to discuss any press releases, please contact T.J. Mahoney. High-resolution images are available upon request. Read more about Railserve LEAF on our News page. 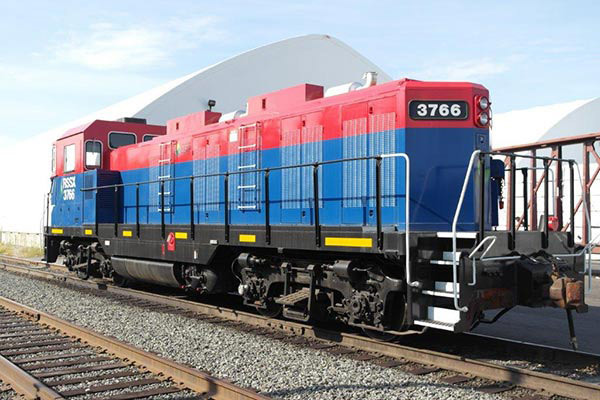 Railserve uses LEAF Genset locomotives in their switching operations in the U.S. and Canada. To learn more about Railserve Switching (Shunting), please visit Railserve.biz.